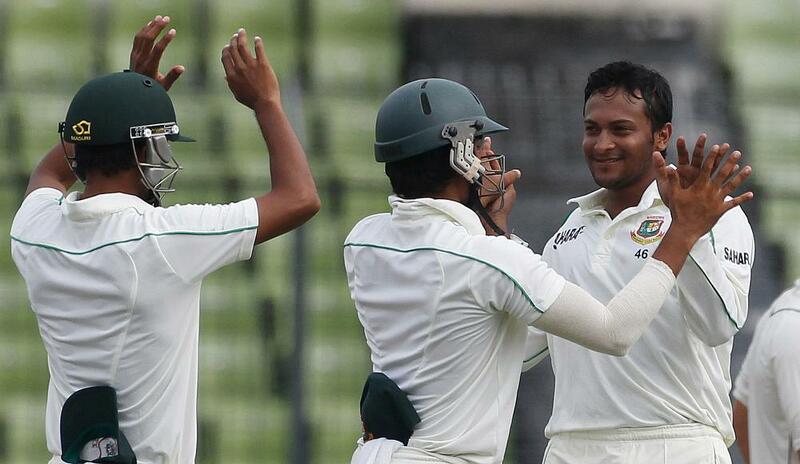 For picking a 10-wicket haul and scoring an 84 run knock in Bangladesh's historic victory over Australia in the first Test in Mirpur, Shakib Al Hasan is the Cricket World Player of the Week. After Pat Cummins rocketed the top order of Bangladesh, Shakib and Tamim Iqbal shared a 155 run stand between them with the all-rounder contributing 84 runs while the latter slammed 71 runs to set up the total of 260 runs. Australia could not combat the spin of the Bangladesh bowlers as they were bowled out for 217 runs with Shakib being the wrecker in chief with a five wicket haul. In their second innings, despite a six wicket haul from Nathan Lyon, Bangladesh did well to recover and post a target of 266 runs riding on another half-century with Tamim and in response, despite a fluent century from David Warner, Australia fell 20 runs short of the target. 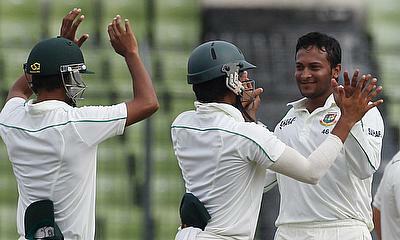 Shakib once again picked a five wicket haul and overall snared 10 wickets in the game to claim the man of the match. Shakib's closest contender is Indian captain Virat Kohli, who scored back to back centuries in the fourth and fifth One-Day International against Sri Lanka in Colombo. Rohit Sharma too slammed a century in the fourth game while Angelo Mathews slammed twin fifties. Bhuvneshwar Kumar also came up with a special bowling performance in the final game with a five wicket haul as the visitors completed a 5-0 series whitewash against Sri Lanka. There were also some special performances in the Caribbean Premier League tournament. Sohail Tanvir bowled the spell of the tournament where he picked five wickets and conceded just three runs in the four overs in game 25 while Kumar Sangakkara slammed three consecutive half-centuries in the tournament. The 27th game saw Dwayne Smith scoring his second century in the season and the same match also Rakheel Cornwall hitting 78 runs. Evin Lewis (97 not out), Chadwick Walton (84 not out) and Wayne Parnell (44 and three wickets) were the other special performers in the week.